The Manchester Community Music School offers a wide array of high quality music programs, including private lessons, music therapy, early childhood, Suzuki, summer camps, and NH Youth Ensembles. Our Music Therapists provide in-house MT services and also work in partnership with public schools, adult day programs, afterschool programs, and hospitals in Manchester and the surrounding communities. 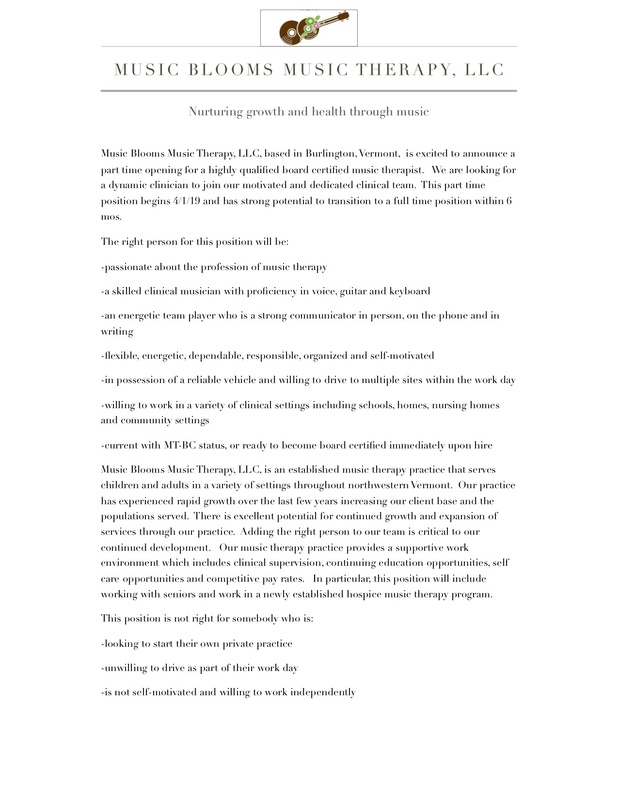 We are looking for a Board Certified Music Therapist to join our team! This part-time (hourly) position has the potential for increasing hours as our program continues to expand and new contracts develop. – Children/youth in hospital and/or other community settings. – Planning, organizing, and leading goal focused music therapy sessions for groups and individuals with diverse skills, abilities, and needs in a variety of locations. Hours could include daytime, afterschool, and/or evening times. NH Youth Ensemble Program, and community music programs. Our Music Therapists provide in-house MT services and also work in partnership with public schools, assisted living facilities, adult day programs, afterschool programs, and hospitals in Manchester and surrounding communities. We are excited that our Music Therapy Program is growing and we are looking for Board Certified Music Therapists to join our great team! 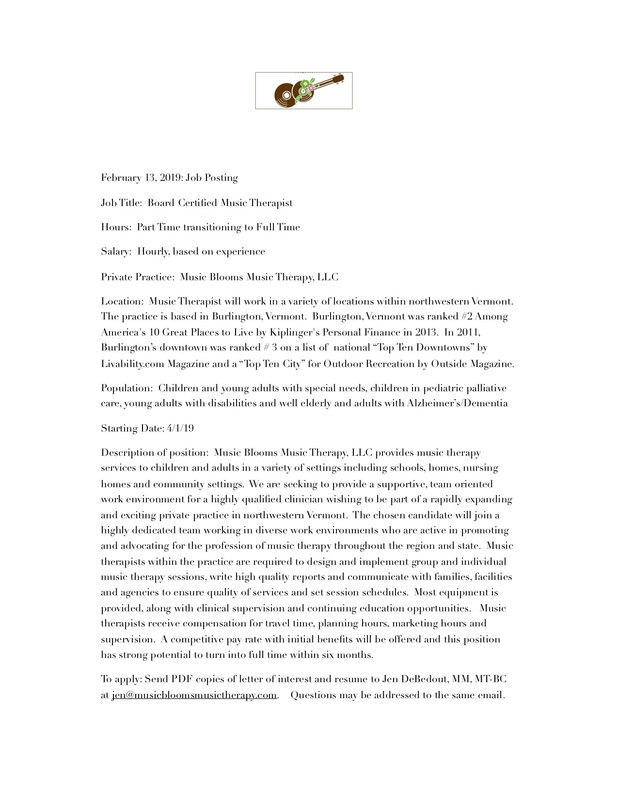 Description: Two well established music therapy practices are seeking a qualified and enthusiastic music therapist to hire.Granite State Music Therapy, LLC & The Rhythm Tree, LLC are hiring! The music therapist will provide music therapy services in homes, schools, and communities for children and adults with developmental disabilities. Therapy will be provided within the guidelines and standards of the American Music Therapy Association (AMTA). Qualifications: Minimum undergraduate degree in Music Therapy attained from an approved program by the AMTA in conjunction with being board certified. As an independent contractor you will need to provide your own professional liability insurance and instruments. Description: A well-established private music therapy practice is seeking an enthusiastic board-certified music therapist as an independent contractor. The music therapist will provide music therapy services in homes, schools, and communities for children and adults with intellectual and developmental disabilities. Therapy will be provided within the guidelines and standards of the American Music Therapy Association (AMTA). Qualifications: Minimum undergraduate degree in Music Therapy from a college or University program approved by the AMTA in conjunction with being board certified or eligible to sit for the exam. As an independent contractor you will need to provide your own instruments and liability insurance. Contact: Elizabeth Ferguson at GraniteStateMusicTherapy@gmail.com.